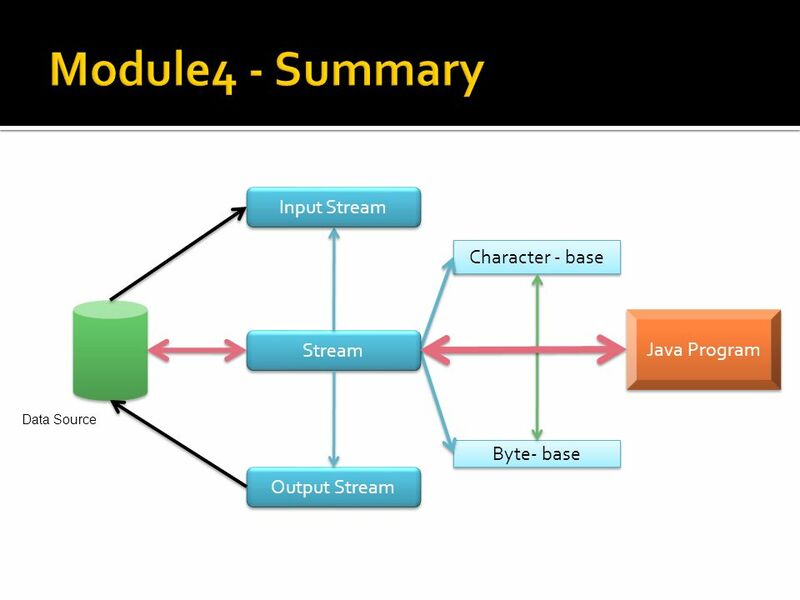 A Guide to Advanced Java Faculty:Nguyen Ngoc Tu. 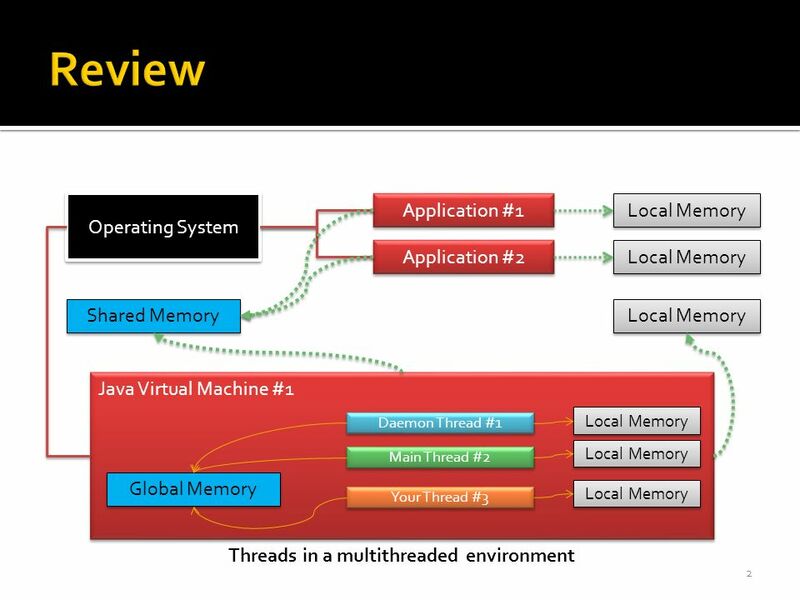 2 Operating System Application #1 Application #2 Java Virtual Machine #1 Local Memory Shared Memory Threads. 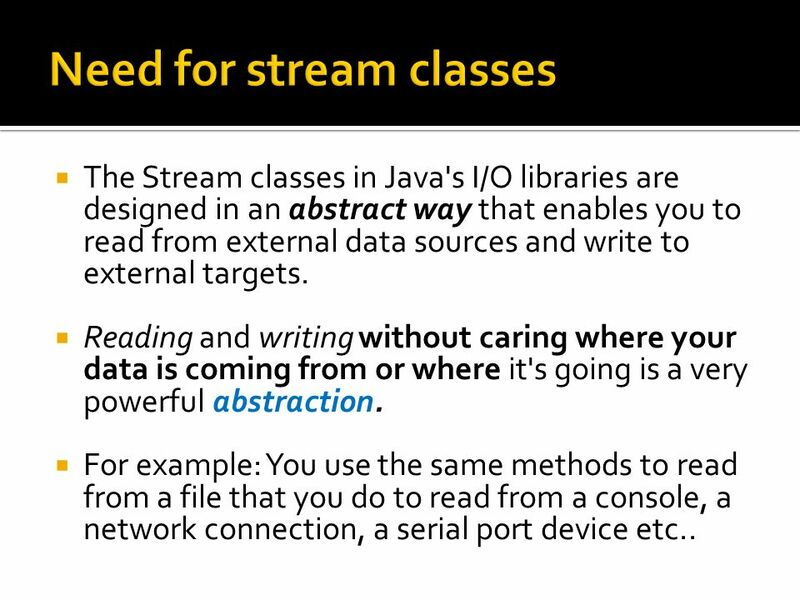 6 The Stream classes in Java's I/O libraries are designed in an abstract way that enables you to read from external data sources and write to external targets. Reading and writing without caring where your data is coming from or where it's going is a very powerful abstraction. 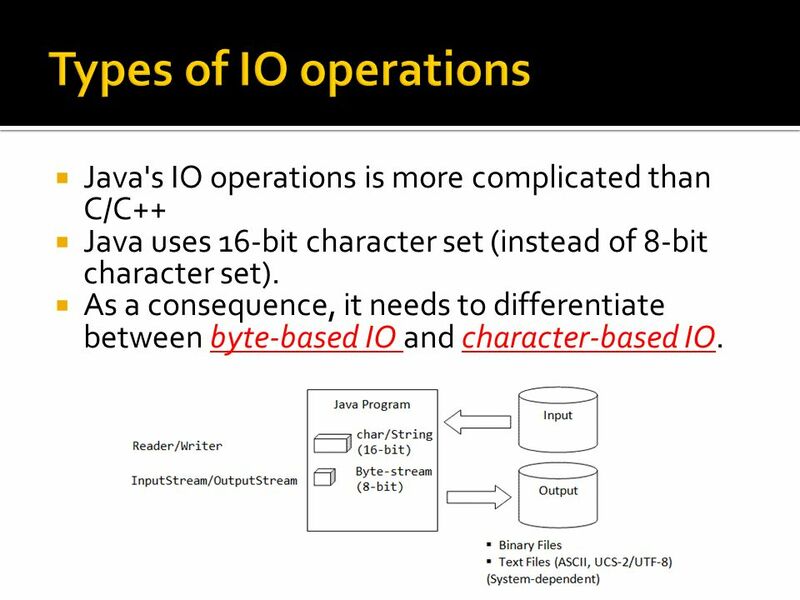 For example: You use the same methods to read from a file that you do to read from a console, a network connection, a serial port device etc..
8 Java's IO operations is more complicated than C/C++ Java uses 16-bit character set (instead of 8-bit character set). 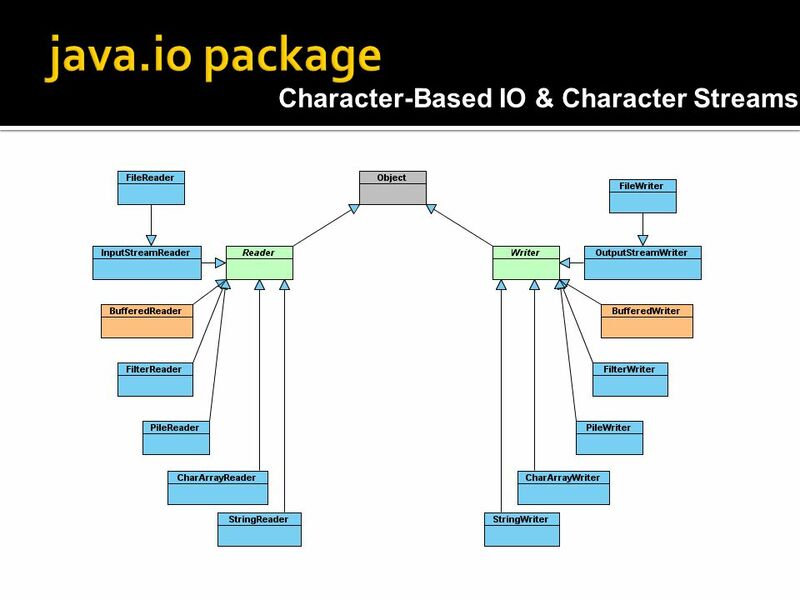 As a consequence, it needs to differentiate between byte-based IO and character-based IO. 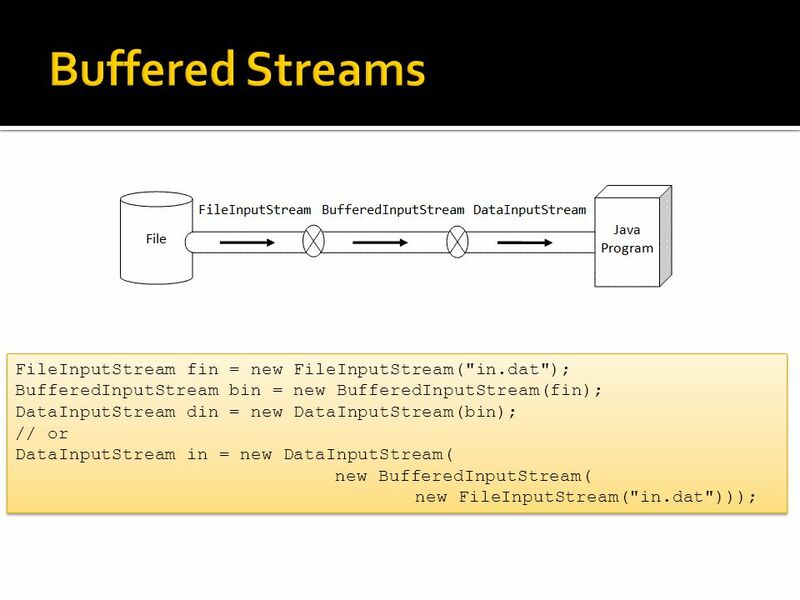 14 FileInputStream class is used to read bytes from a file. 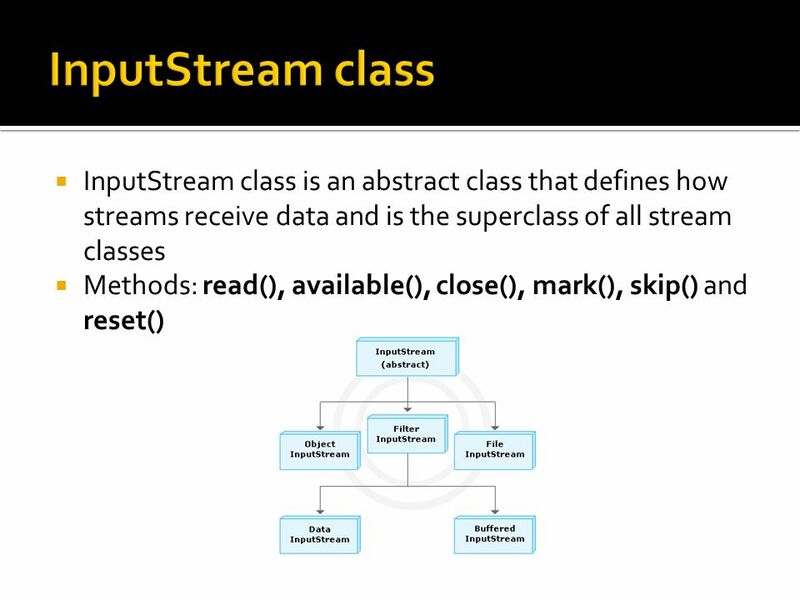 FileInputStream class overrides all the methods of the InputStream class except mark() and reset(). 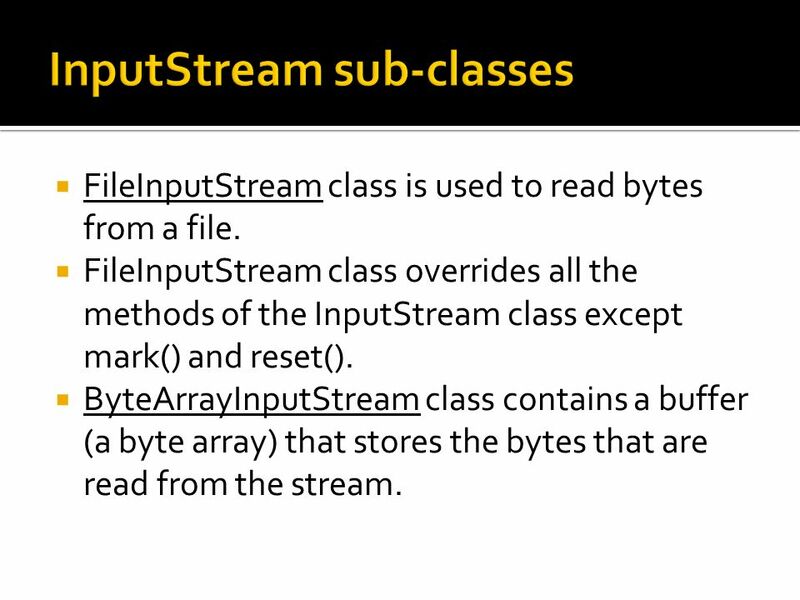 ByteArrayInputStream class contains a buffer (a byte array) that stores the bytes that are read from the stream. 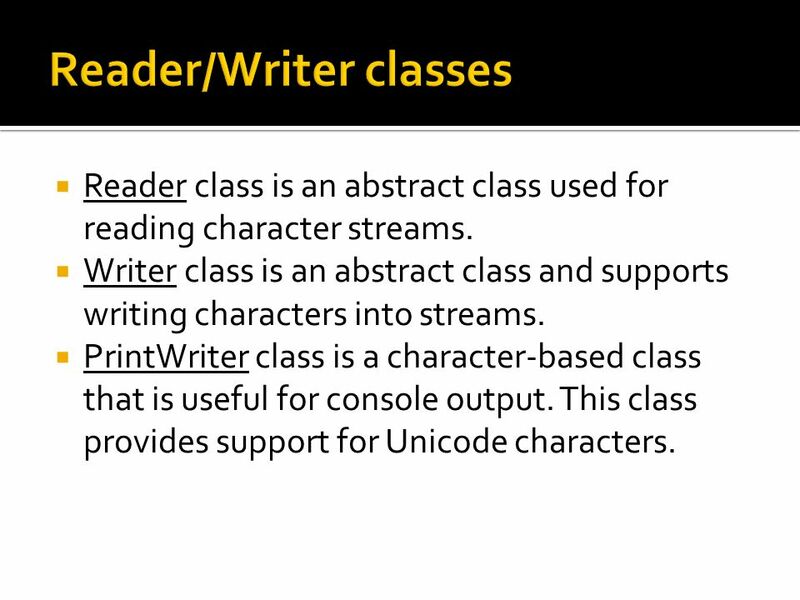 22 Reader class is an abstract class used for reading character streams. Writer class is an abstract class and supports writing characters into streams. PrintWriter class is a character-based class that is useful for console output. This class provides support for Unicode characters. 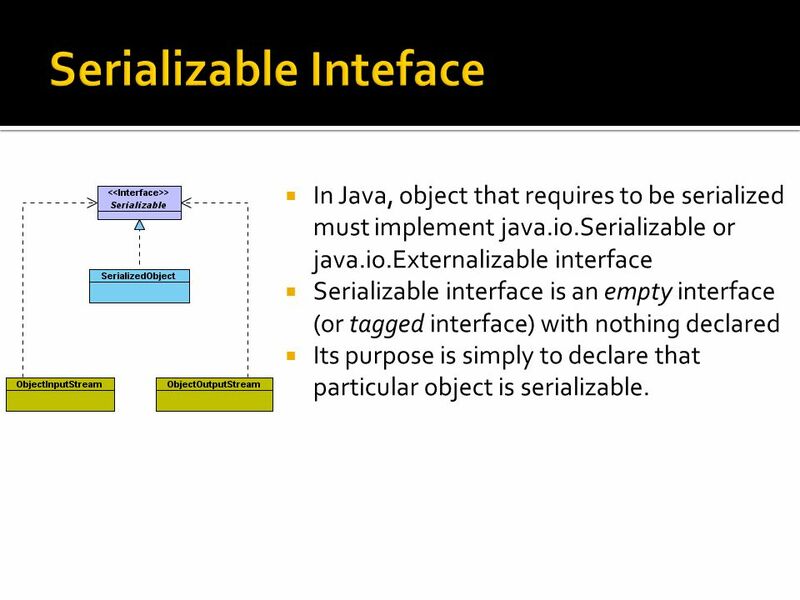 25 In Java, object that requires to be serialized must implement java.io.Serializable or java.io.Externalizable interface Serializable interface is an empty interface (or tagged interface) with nothing declared Its purpose is simply to declare that particular object is serializable. 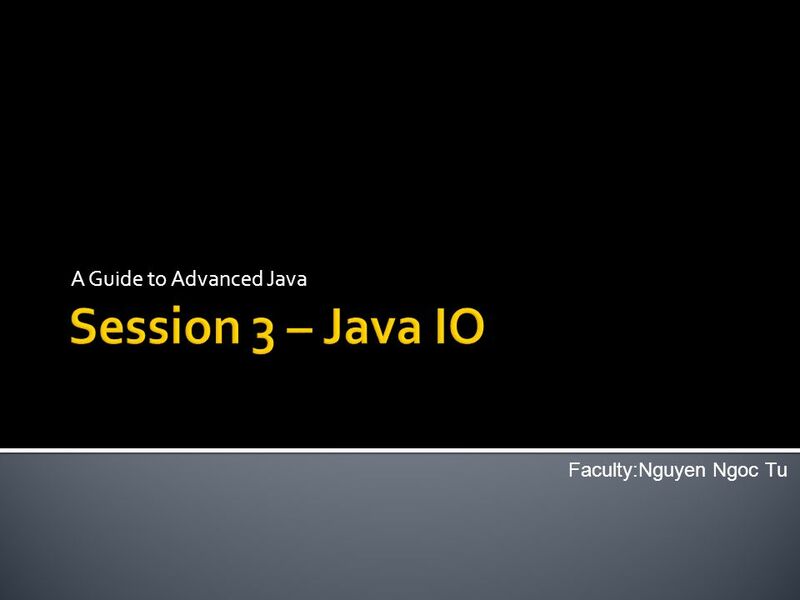 Download ppt "A Guide to Advanced Java Faculty:Nguyen Ngoc Tu. 2 Operating System Application #1 Application #2 Java Virtual Machine #1 Local Memory Shared Memory Threads." 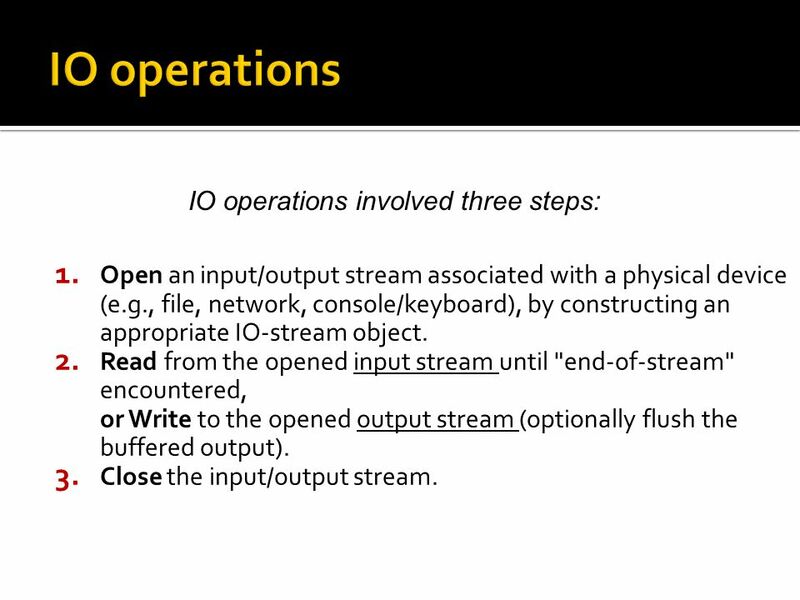 1 Streams and Input/Output Files Part 3. 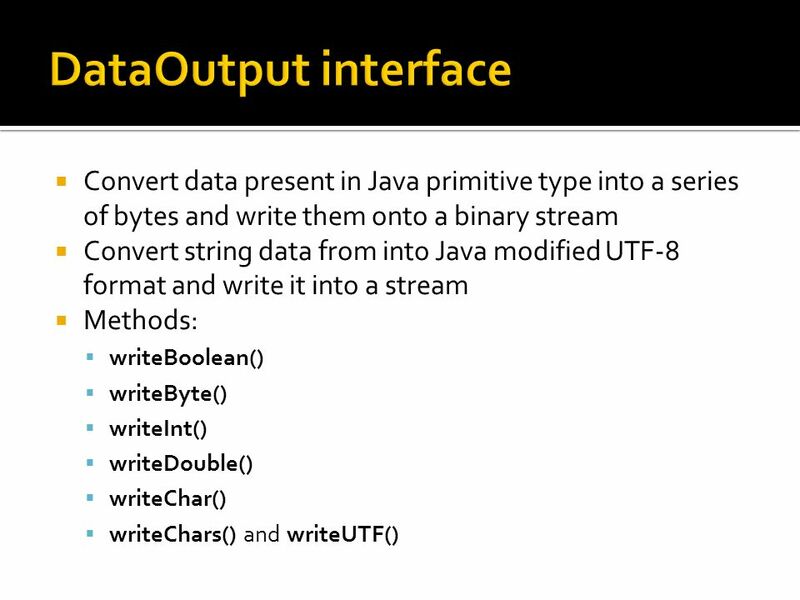 2 Handling Primitive Data Types The basic input and output streams provide read/write methods that can be used. 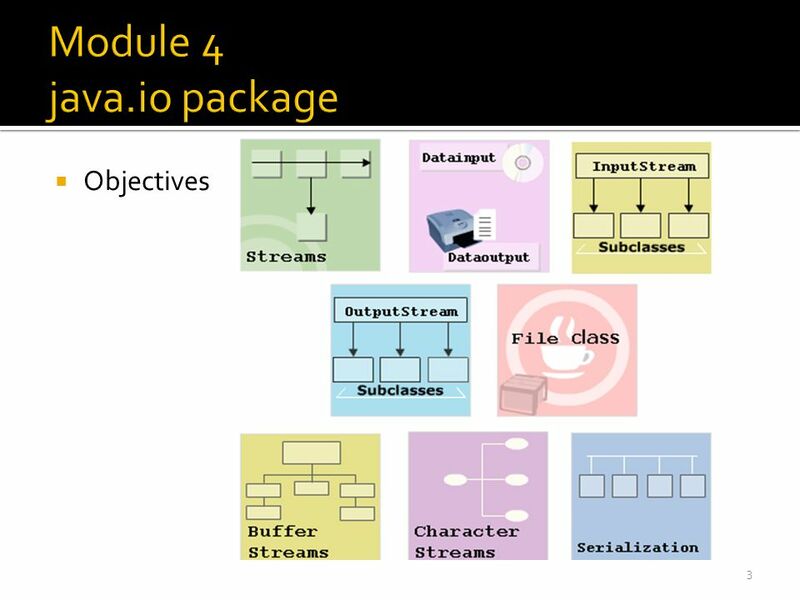 1 Streams and Input/Output Files Part I. 2 Introduction So far we have used variables and arrays for storing data inside the programs. This approach poses. Jan Java I/O Yangjun Chen Dept. Business Computing University of Winnipeg. 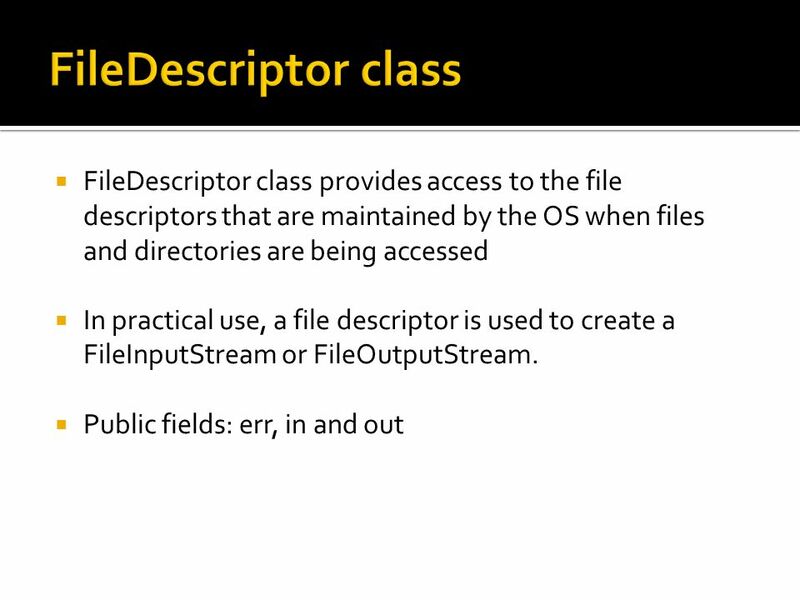 Introduction to Java 2 Programming Lecture 7 IO, Files, and URLs. Exceptions. Definition Exception: something unexpected that can occur in the execution of a program e.g., divide by zero or attempt to open a file that. 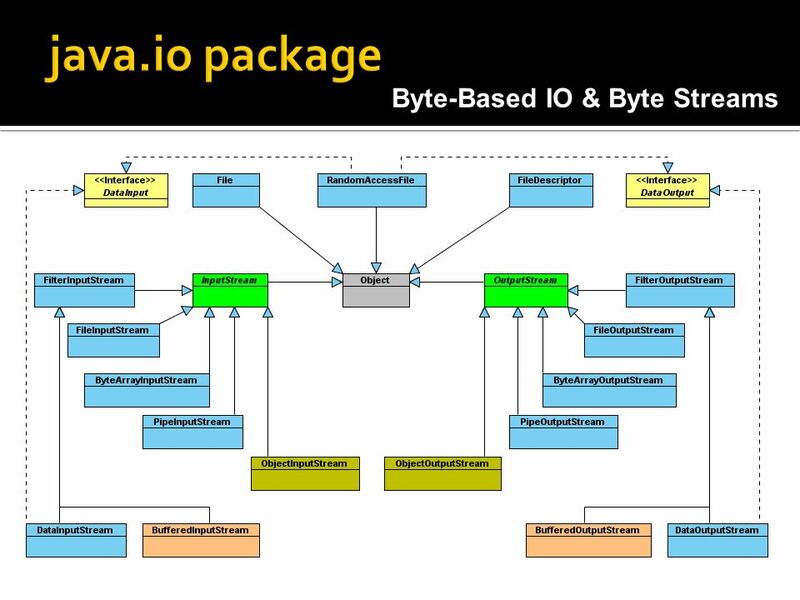 The Package Statement Group related interfaces and classes together Purpose: encapsulation and reduces name conflicts –private package classes not visible. 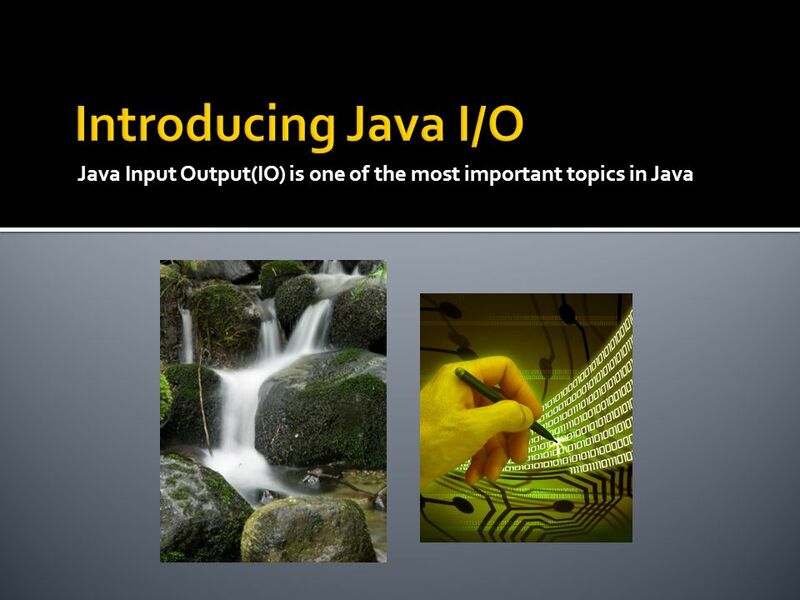 Java File I/O. 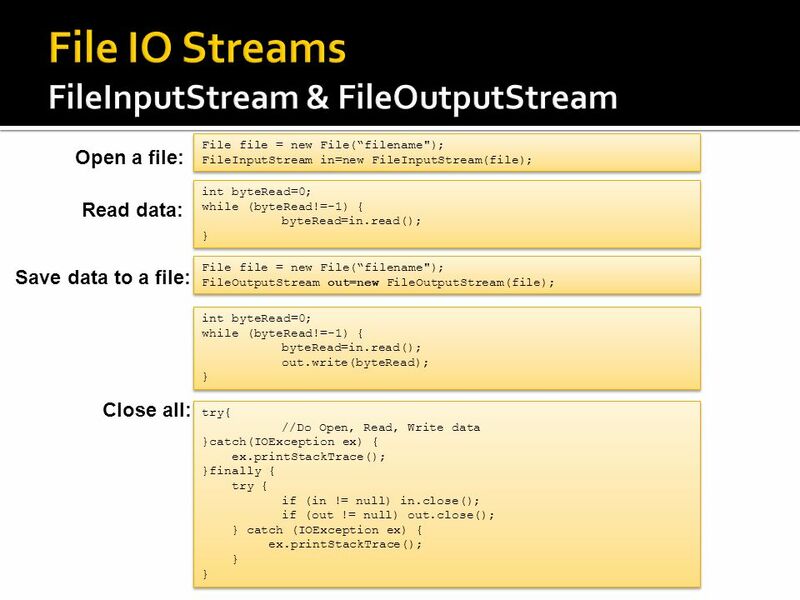 File I/O is important! Being able to write and read from files is necessary and is also one common practice of a programmer. Examples include. MOD III. 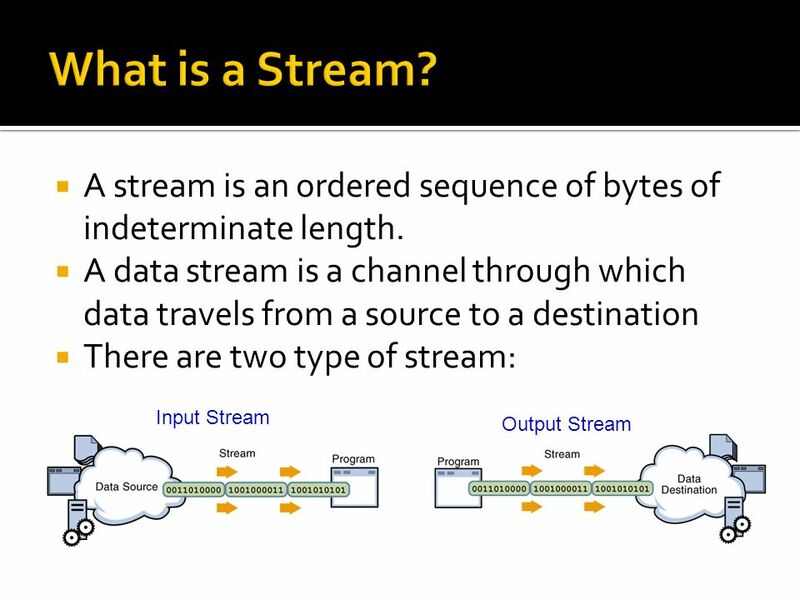 Input / Output Streams Byte streams Programs use byte streams to perform input and output of 8-bit bytes. This Stream handles the 8-bit. Streams Dwight Deugo Nesa Matic Portions of the notes for this lecture include excerpts from. 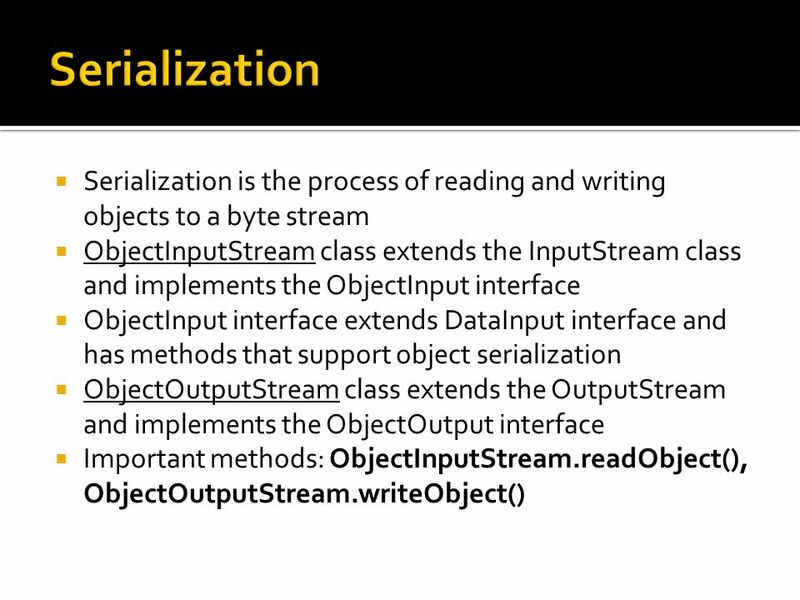 Slide 10.1 Advanced Programming 2004, based on LY Stefanus’s Slides Object Serialization Object serialization: the process of converting an object into. 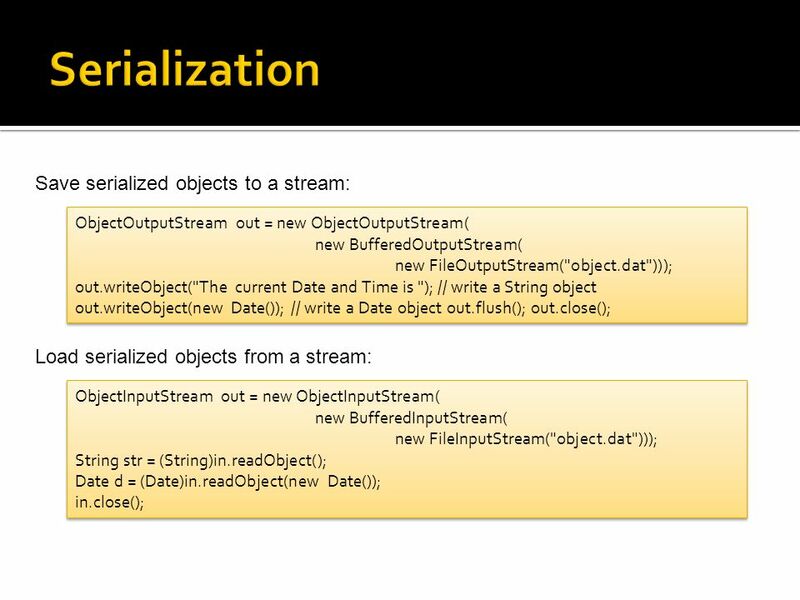 Geoff Holmes Overview IO Zoo Stream I/O File I/O Buffering Random-Access Text Streams Examples Serialization Java IO – programs that start with import. Files Files are used to store long term data. –Typically referred to as persistent data. –A file is a group of related records. –A list of friends addresses. ©TheMcGraw-Hill Companies, Inc. Permission required for reproduction or display. 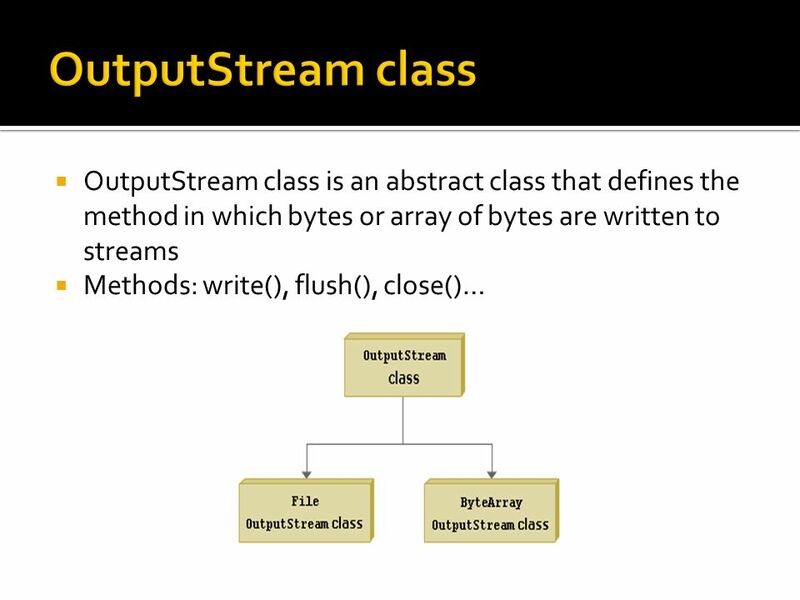 Chapter 12  File Input and Output Stream Classes Text Input and Output. Unit 211 File IO Binary Files Reading and Writing Binary Files Writing Objects to files Reading Objects from files. 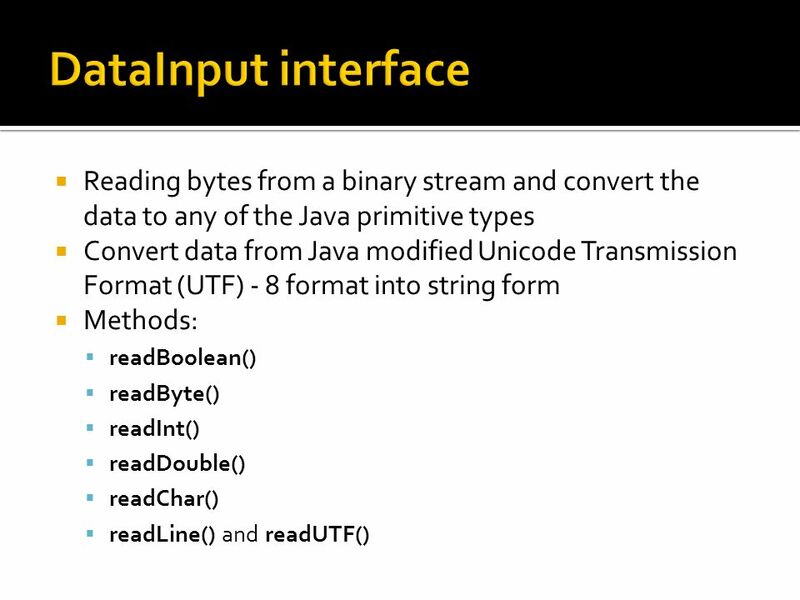 Liang, Introduction to Java Programming, Sixth Edition, (c) 2007 Pearson Education, Inc. All rights reserved L07 (Chapter 18) Binary I/O. Unit 201 File IO Binary Files Reading and Writing Binary Files Writing Objects to files Reading Objects from files. 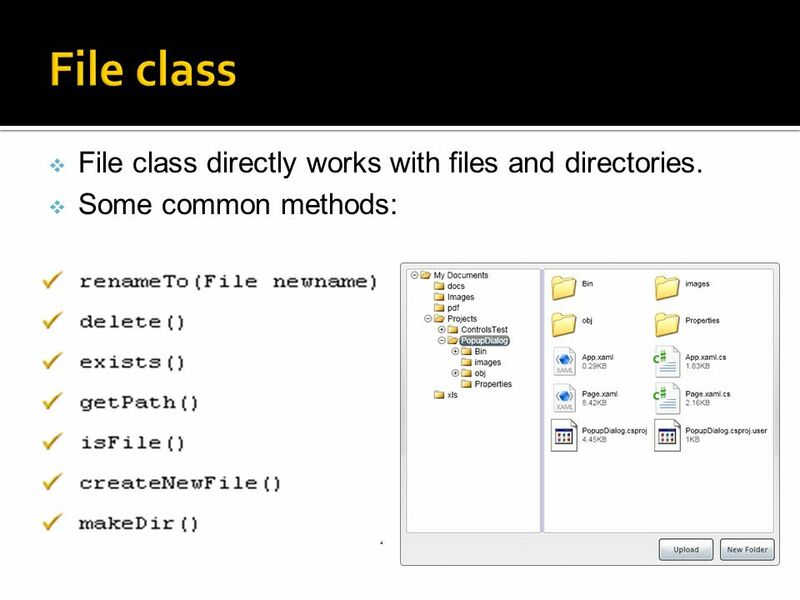 File I/O in Java CS 311, Winter File Basics Recall that a file is block structured. What does this mean? What happens when an application opens. 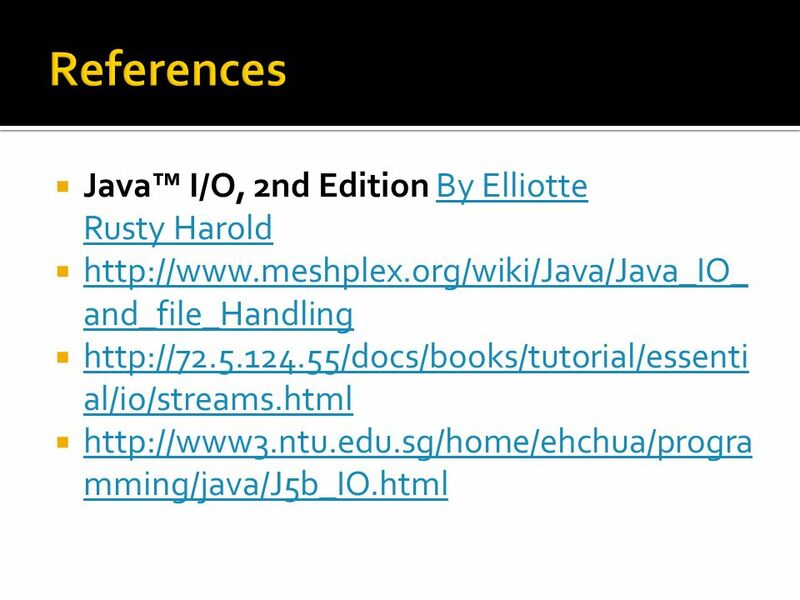 Liang, Introduction to Java Programming, Sixth Edition, (c) 2005 Pearson Education, Inc. All rights reserved Chapter 18 Binary I/O. Liang, Introduction to Java Programming, Ninth Edition, (c) 2013 Pearson Education, Inc. All rights reserved. 1 Chapter 19 Binary I/O.